How was your weekend? Ours was quiet. Boogie was feeling a bit under the weather and still is. Poor guy. So, we are taking it easy today. Josh is working in the garden and little bear Adam and I are going to run errands. 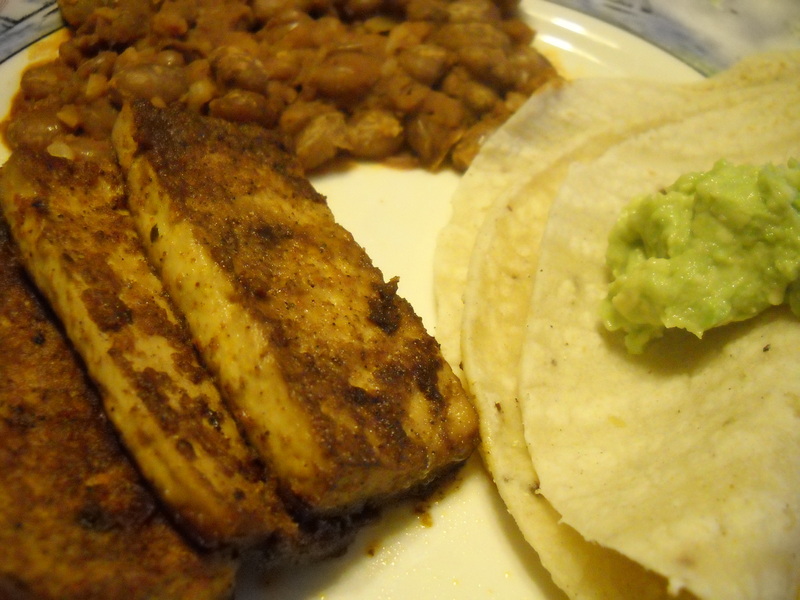 Thursday evening I served a Mexican baked tofu to the co-op with blazing pinto beans, tortillas and guacamole. It was tasty. I really liked the beans, they had a spicy kick to them. We are taking a break in the co-op for the month of May. I have several obligations that I have to take care of. We will start back up again in June. Still look for awesome food we will be cooking here at Two Vegan Boys blog. Friday I was really excited to pick up my first ever CSA box. As some of you know we have a garden and I thought a CSA would be a nice addition to what vegetables we have not planted in our garden. The farm that we have our CSA through is local, only 7 miles from our home and is organic. I love that the vegetables are picked fresh and delivered in the same day. As well as being seasonal. I decided to split the CSA with a good friend. So we get a ton of organic veggies for only $15 a week. After seeing my half of the box, there is no way I could have purchased that many vegetables for $15. I am looking forward to this week’s box. Friday I spent all day baking for a friend. Her daughter turned a year old. 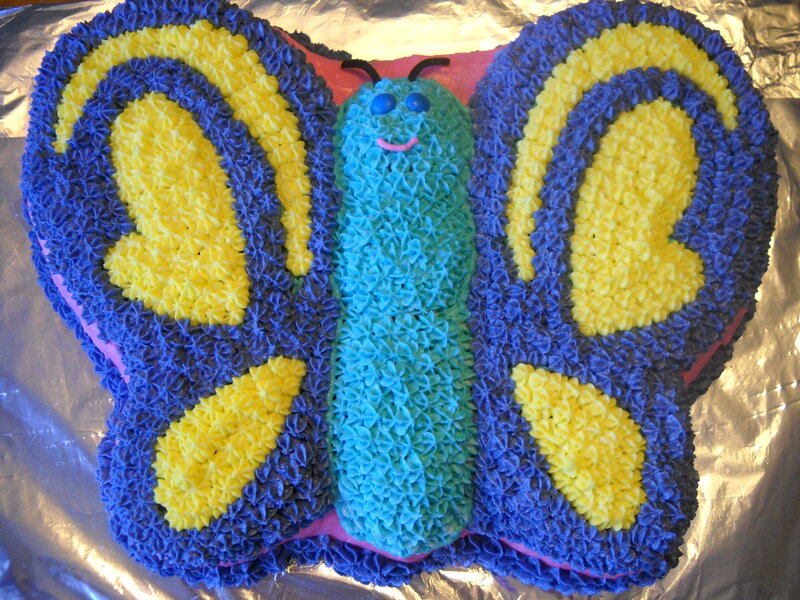 So, I made a butterfly cake and cupcakes. The picture does not show the colors accurately. 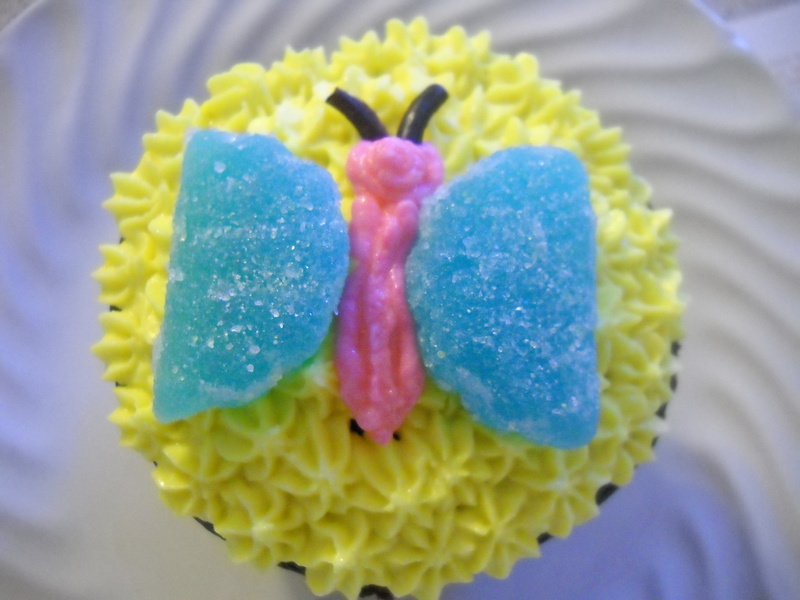 The butterfly was lavender, pink, light teal, and yellow. 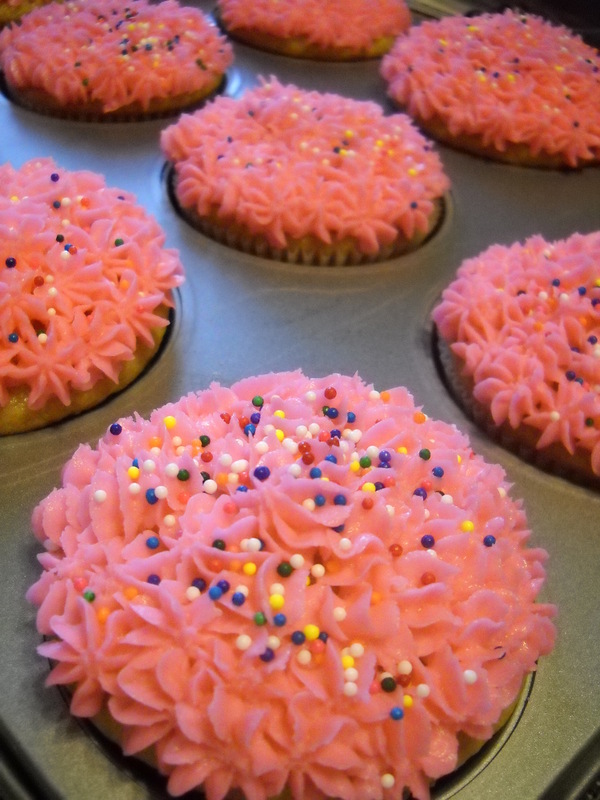 I made a dozen cupcakes with candy butterflies. 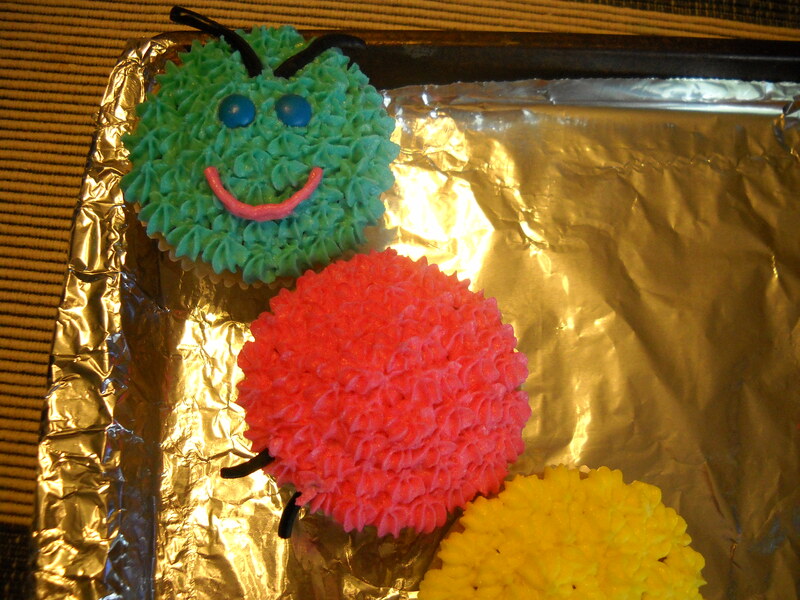 I also made a dozen cupcakes to form a caterpillar. Once again the camera did not show the colors properly. The colors were lavender, pink, yellow, and light teal. Saturday I made a giant salad for dinner thanks to our CSA. I also made a mustard vinagrette to accompany it. Such goodness. 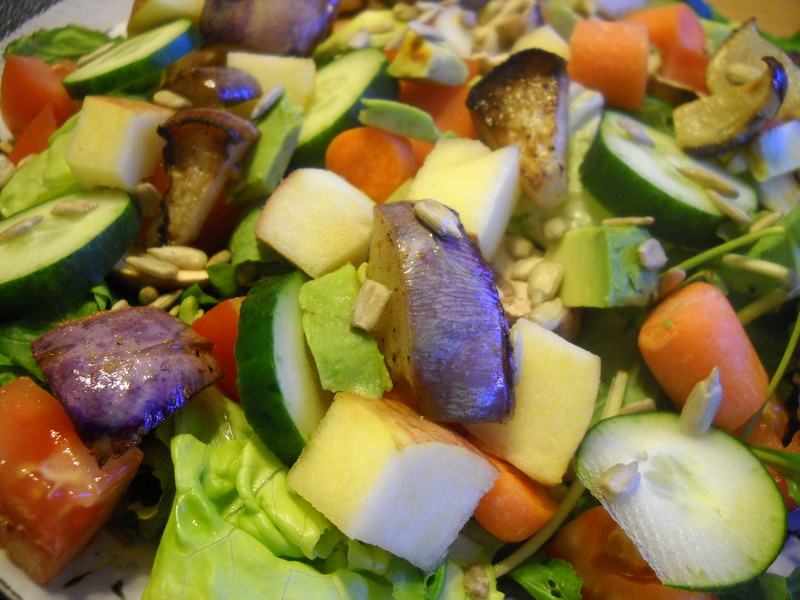 The salad had roasted kohlrabi, lettuce, carrots, cucumbers, tomatoes, mushrooms, sunflower seeds, apple, avocado, and sliced shallot. It was so good. And for dessert, organic strawberries. 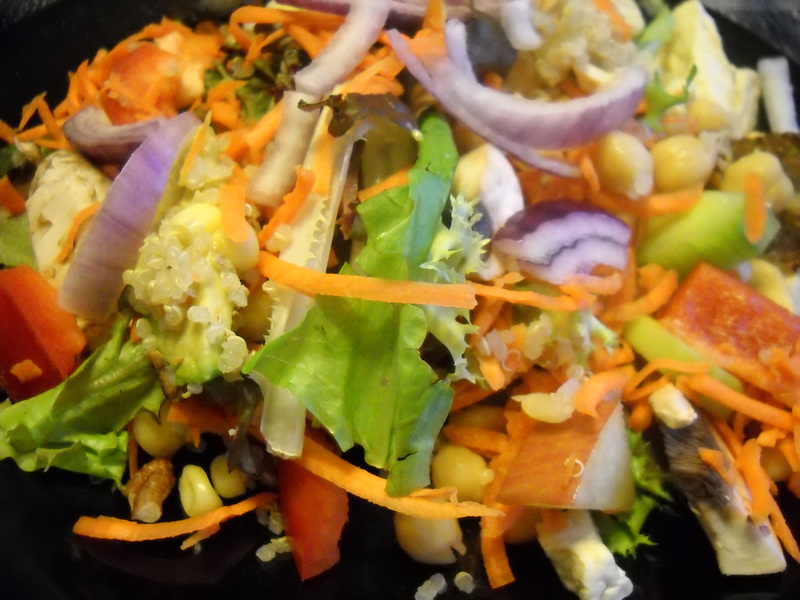 Here is a recipe for a tasty mustard vinagrette I made for the salad. Combine all the ingredients and pour over a salad. Yesterday I made a simple greens and beans dish for lunch using one bunch of mustard greens from our garden and some carrots from our CSA box. It was so tasty. I will definitely make it again. The recipe did not have much spices in it due to the fact that fresh mustard greens have a powerful horseradish punch to them. Very tasty. For dinner last night I made “chicken” and dumplins. It made a ton and was great for a nice hearty meal. I added chickpeas, corn, some flatleaf parsely from our CSA to the mix as well. Since we are taking a break from the dinner co-op for a month, I am reinstating Meal Plan Monday. Here is our meal plan for the week. Monday-African Rolls, using kale and cilantro from our garden. Tuesday-Roasted carrot and fennel soup with bread, using fennel and carrots from our CSA. Wednesday-Cannellini salad with mint and lemon baked tofu, using mint from our garden. Thursday-Orange Ginger Beets and Greens with couscous, using beets and greens from our CSA. Friday-Ziti with Italian “sausage” and garlic bread. Well I am off to run some errands. Hope you have a lovely Monday. 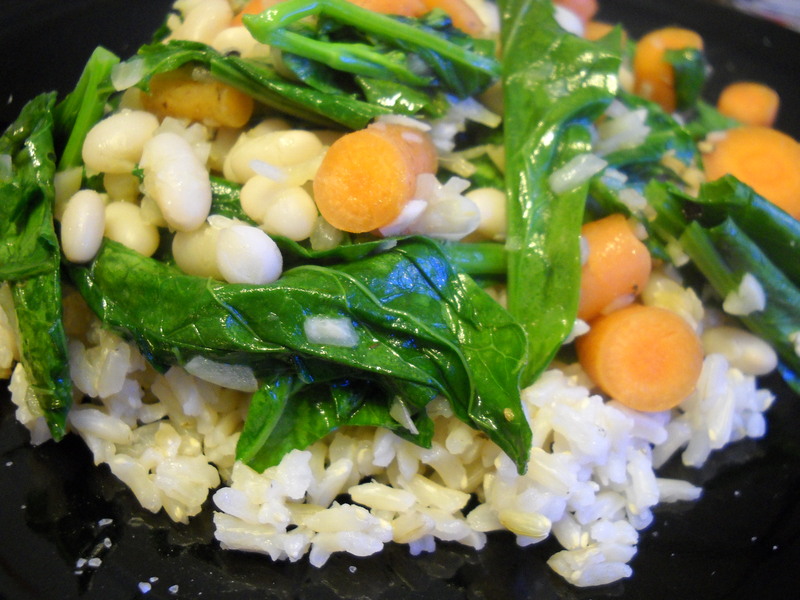 Monday our co-op meal was white beans with greens and brown rice. We were also brought some homemade raisin bran muffins. The boys scrarfed those down in no time. The meal was tasty. One thing I forgot to mention about this dinner co-op is the fact that all the ladies that cook, have gardens, so we get fresh veggies from the gardens added to our meals. How awesome is that? 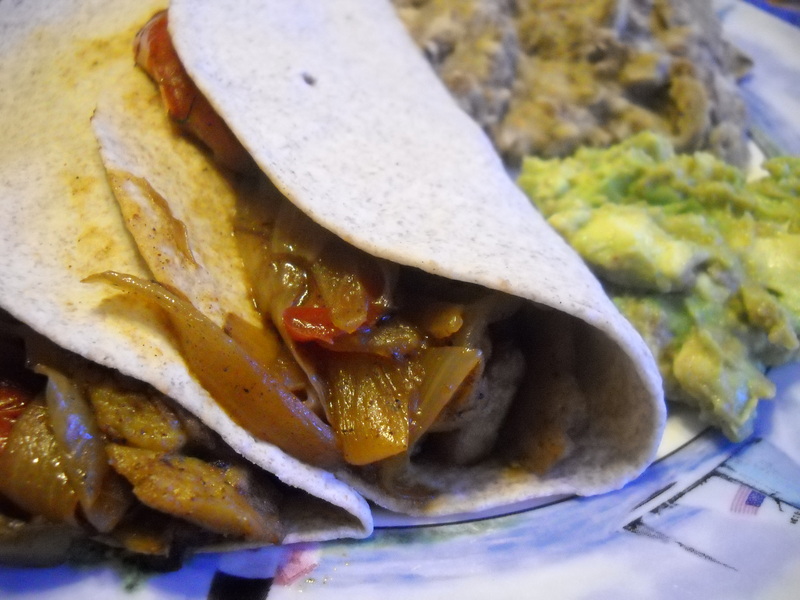 Tuesday we were delivered seitan fajitas. Yum! We love fajitas around here. They were served with refried beans and guacamole. Last night we were served a meal similar to Monday night’s dinner. It was tasty too. 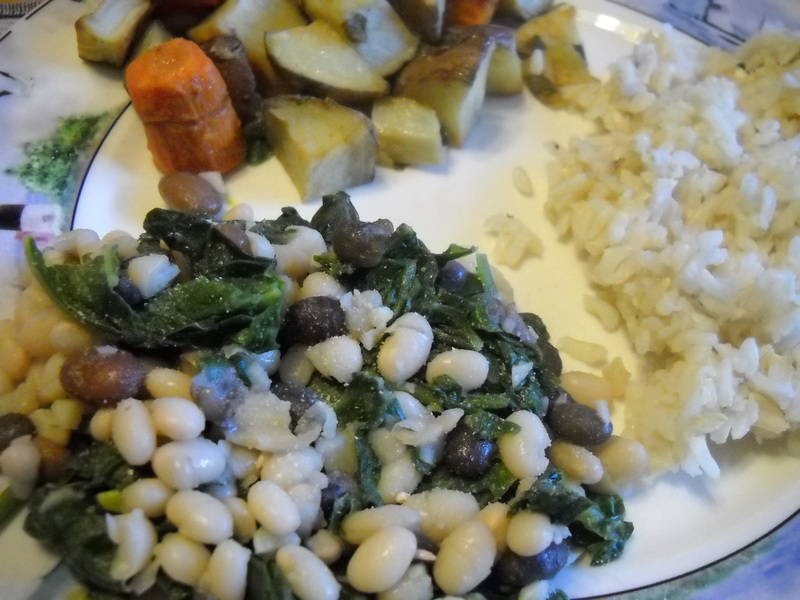 It was a mix of brown and white beans sauteed with greens from the garden, brown rice and roasted carrots and potatoes. Little bear Adam loved the whole meal. Arthur opted for the potato/carrot mix and the rice. 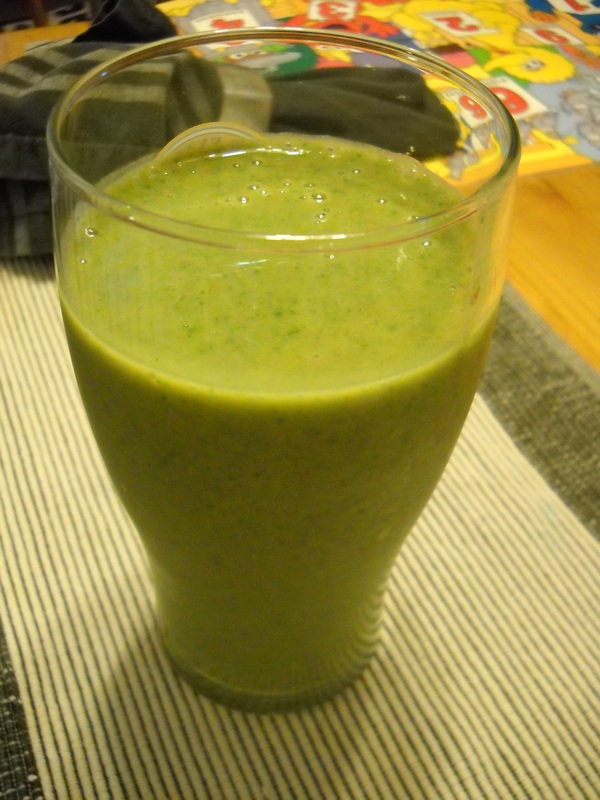 I am posting a picture of a smoothie. I know some of you may be thinking, “what’s so special about a smoothie?” Well in Arthur’s case, it is a big deal. Out of our two little guys he is our pickier of the two. Adam is the bottomless pit. He will eat and try anything. Arthur, not so much. His favorite line when he sees something new is “That’s not my favorite.” So, during the week, I will make him a smoothie every other day to make sure he gets his daily serving of vegetables. Yesterday I made him a smoothie with a serving of swiss chard, a serving of sweet peas, a serving of carrots, a handful of strawberries thrown in, a banana, a splash of orange juice and some soygurt. He loved it. So much that he drank the whole blender’s worth. He called it a “Incredible Hulk” smoothie because it was green. 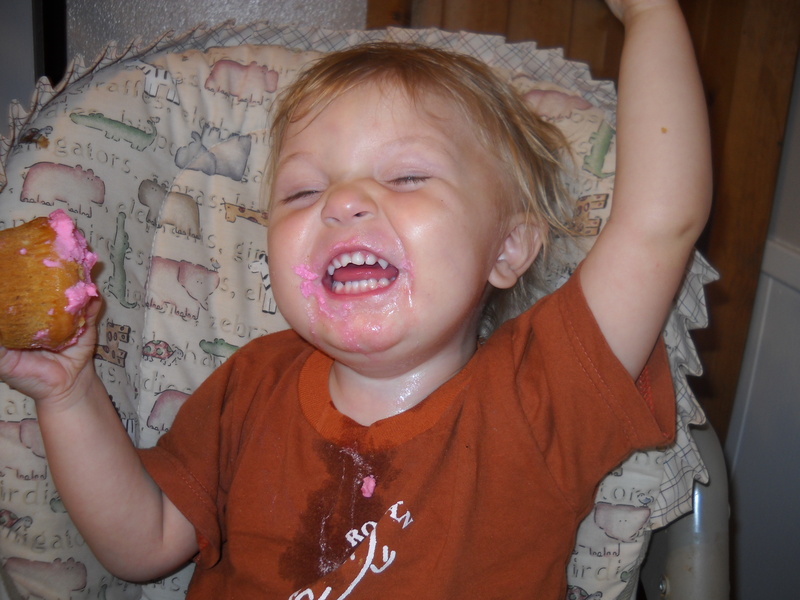 Yay for getting kids to eat their veggies even if you do have to be sneaky. Last night I made cupcakes for Josh to take to work. 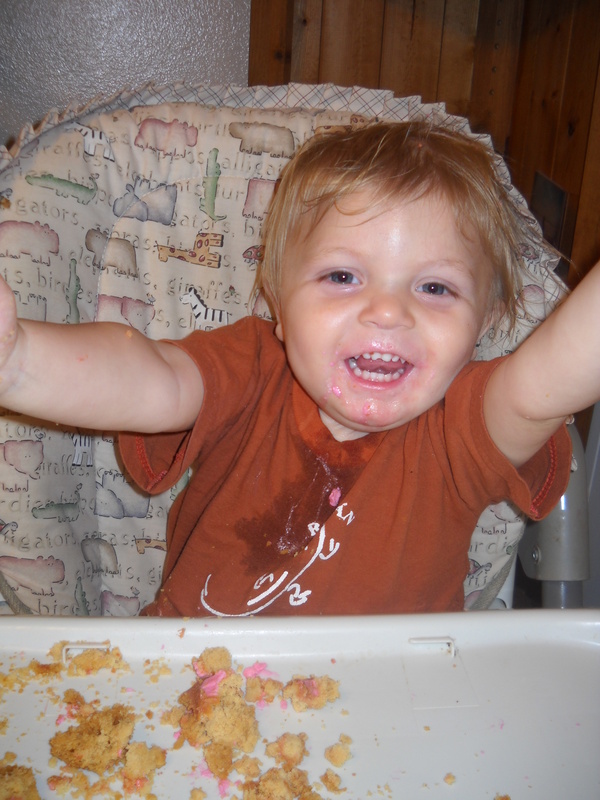 When I was sitting at the table decorating them, Adam was in his high chair. 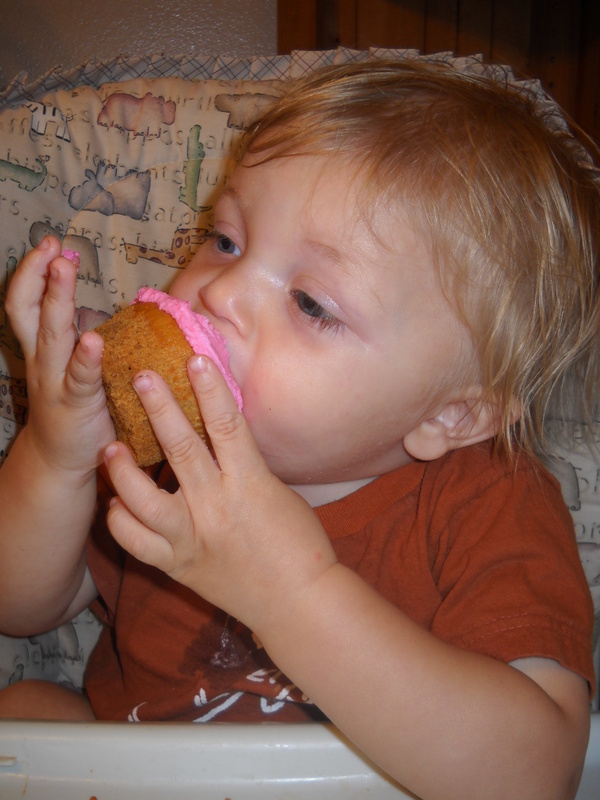 His eyes got big and he kept saying “cupcake” in his baby voice. It was so cute. It is really funny, because Adam has only a few words in his vocabulary. But a majority of the words are food related. You can tell he really likes to eat. Well I am off to do some baking this morning. Hope you each have a lovely Thursday. My two cutie pies playing in the tub together. Who doesn’t love a cupcake? 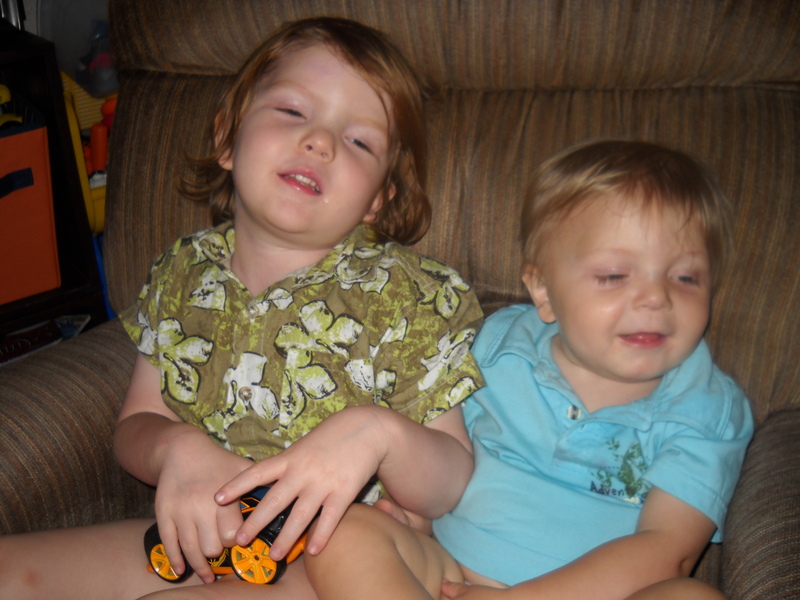 Everyone I know does and my two little guys are no different. 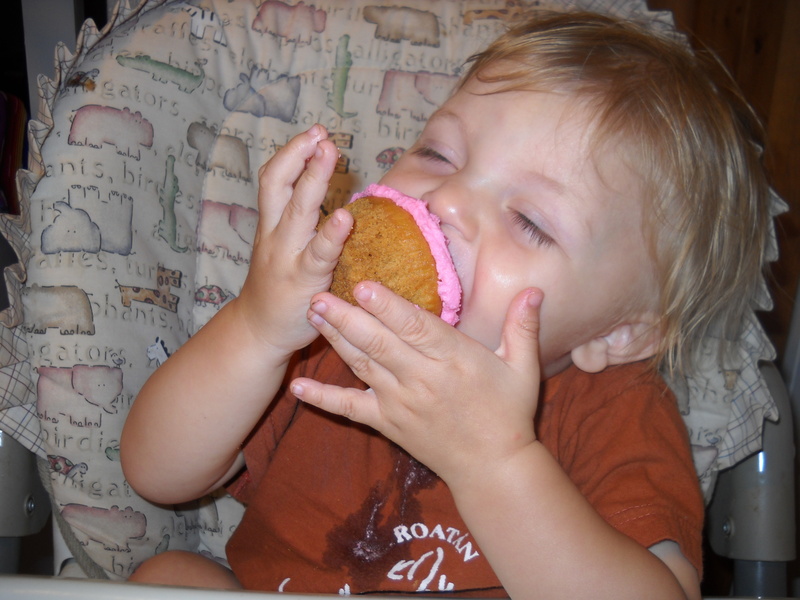 This post is dedicated to a cute baby who loves cupcakes. He turned 18 months old this past Saturday. Where has the time gone? If you are having a bad day or know someone who is, just read this post. You are guaranteed to smile. 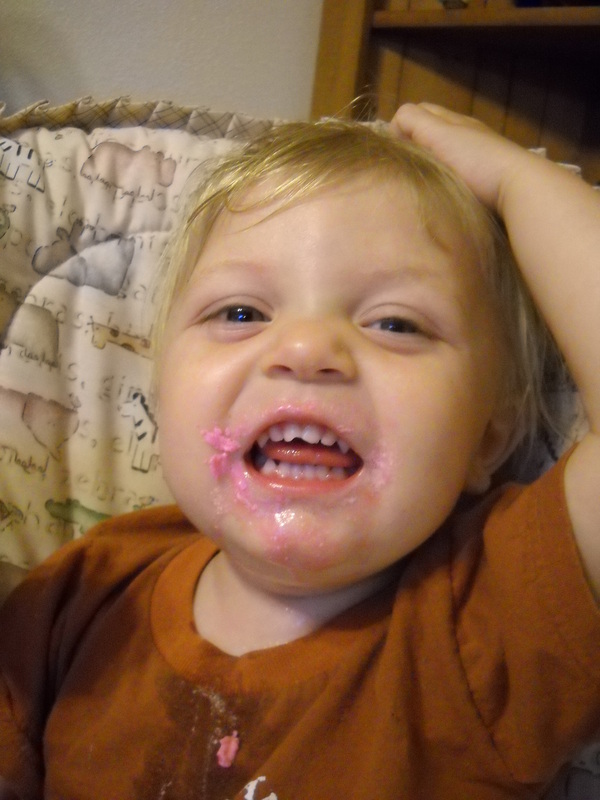 Needless to say, after all of this cupcake fun, he needed a bath. Happy 1/2 birthday little bear. We love you! How was your weekend? Ours was pleasant. Josh did not have to work Saturday, so that is always nice. I will start with the food. 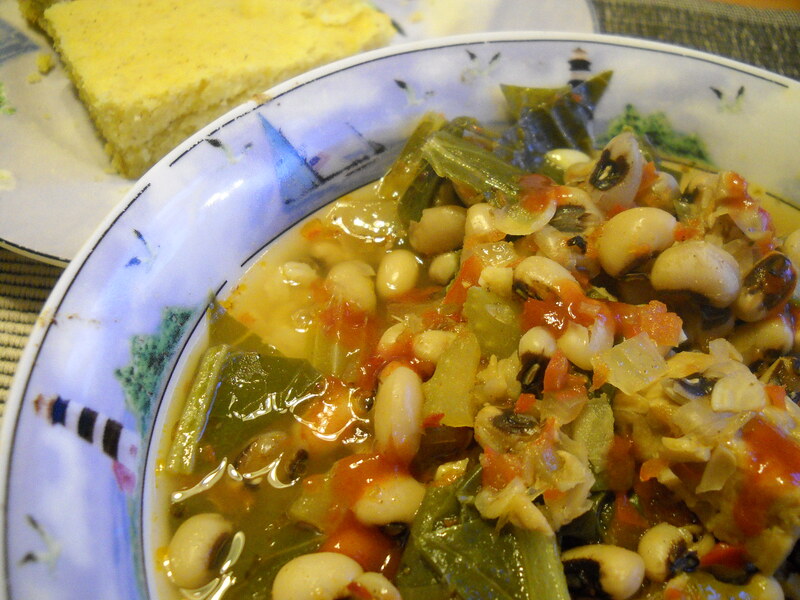 Thursday night I cooked a Southern style mustard greens and blackeyed peas dish for our co-op. It was quite tasty. 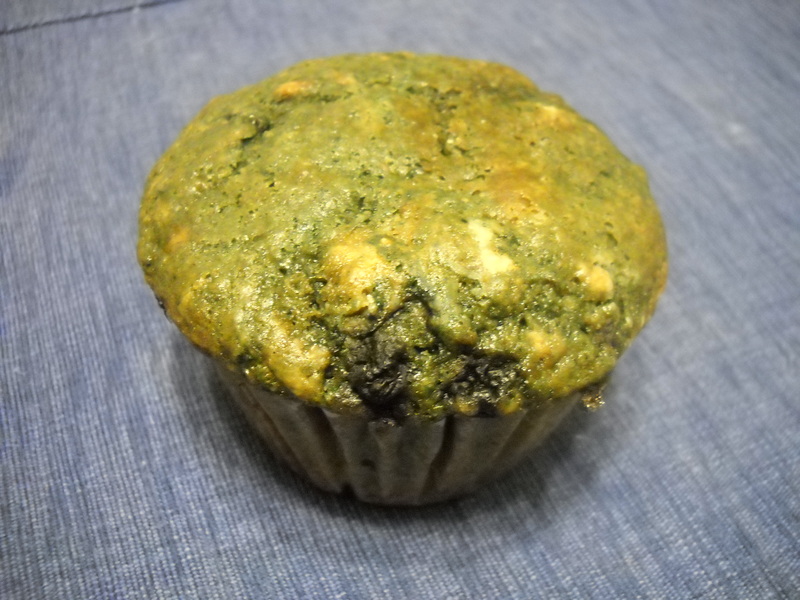 It was a new recipe I created and it was served with some sweet cornbread. Two great things about this meal, the mustard greens were from our garden and the cost of the meal to feed 10 people was $12. Terrific. Friday night was pizza night. The boys had their usual cheeze pizza. 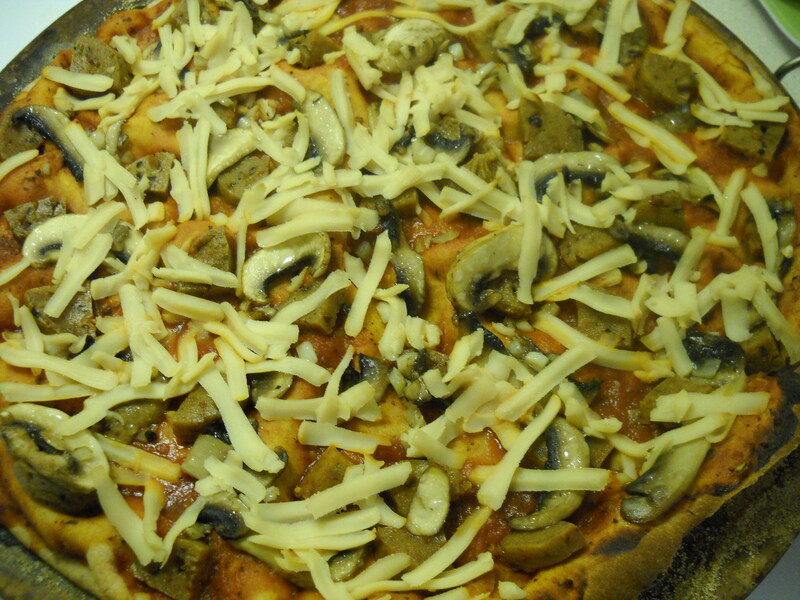 I made a sauteed mushroom and garlic pizza with a vegan Italian sausage for me and Josh. I used a vegan rice cheeze. It was okay. I don’t think I will use it again. It hardly melted and we were not blown away by the taste. Other than the cheeze being just “okay”, the pizza was great. Saturday we went to a local natural and organic garden center called the Natural Gardener. It is so awesome. It has lovely plants and beautiful gardens. 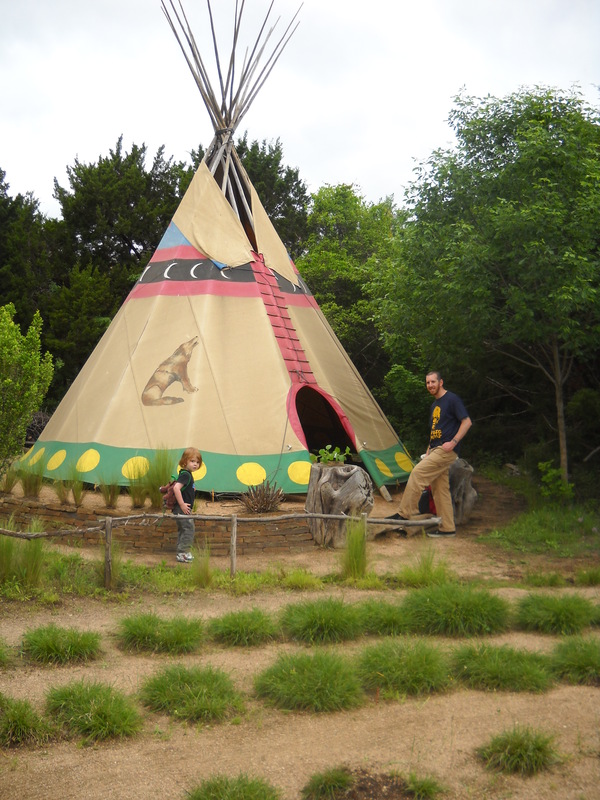 We had a picnic in the teepee and the boys played in the field while enjoying the goats, chickens and donkeys. 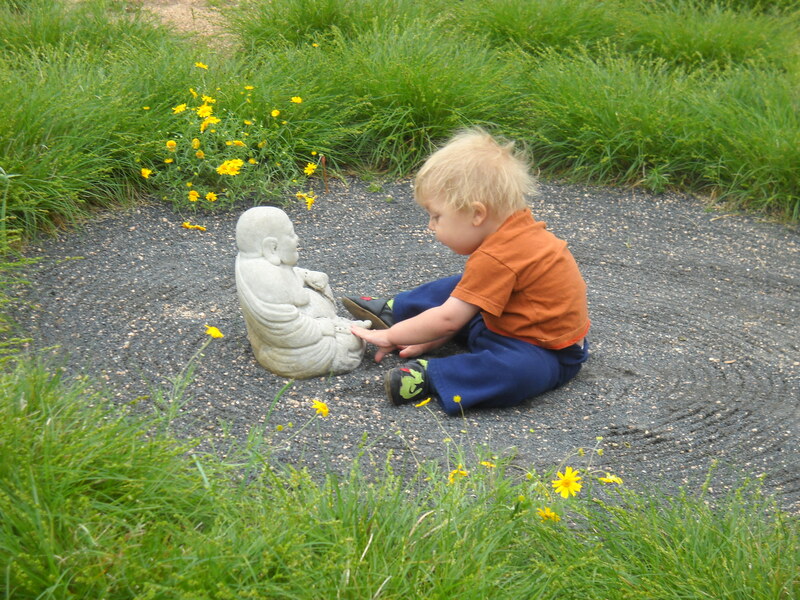 Adam was quite fond of the Buddha statue. 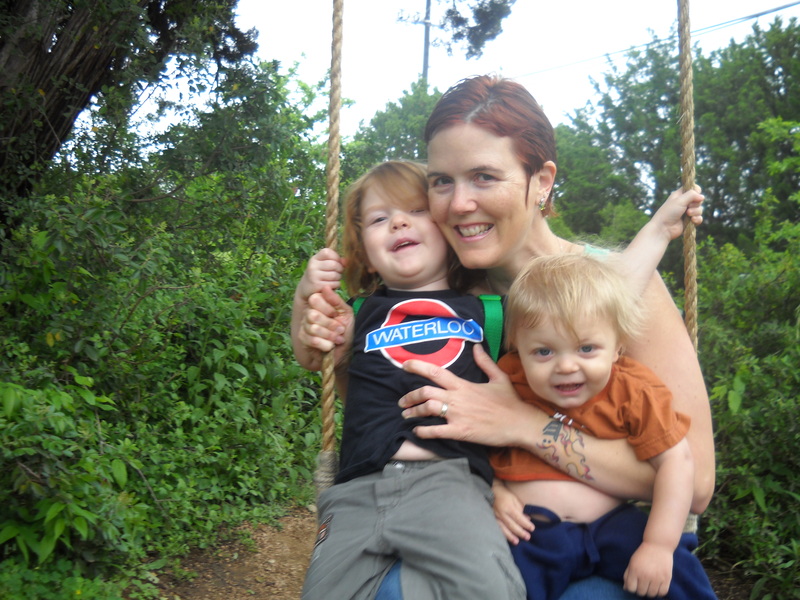 Me and my sweet boys on the swing. The teepee where we had our picnic. Speaking of gardens, our gardens are coming along quite nice. Some of the greens are starting to bolt (flower and go to seed). So we will start planting our Summer veggies. The tomato plants are going crazy. They are getting big and starting to flower. That means very soon we will have fresh tomatoes. Yippee! The basil is also growing well. I love pesto and am so glad to have access to organic fresh basil. The basil in the store is so expensive it is ridiculous. And the sunflower seeds the boys and I planted are getting bigger by the day. I can’t wait until they bloom. We planted skyscraper sunflowers as well as mammoth sunflowers. Which means super big sunflowers will be smiling over our garden. Recently I was sent a new cookbook to review. I will reveal the name of the book in a week or two after I try some more recipes. Last night I made a sandwich recipe from the book. Most of you are thinking, “A sandwich? Big deal.” Well this sandwich was a big deal. It was one of the best sandwiches I have ever tasted. It was perfect. It was an open-faced grilled eggplant and seitan sandwich. Wow! Words cannot express how awesome this sandwich tasted. Well, I am off to do the ugly chore called laundry. Ugh. Hope you each have a lovely evening. This week our co-op meals have been great as usual. 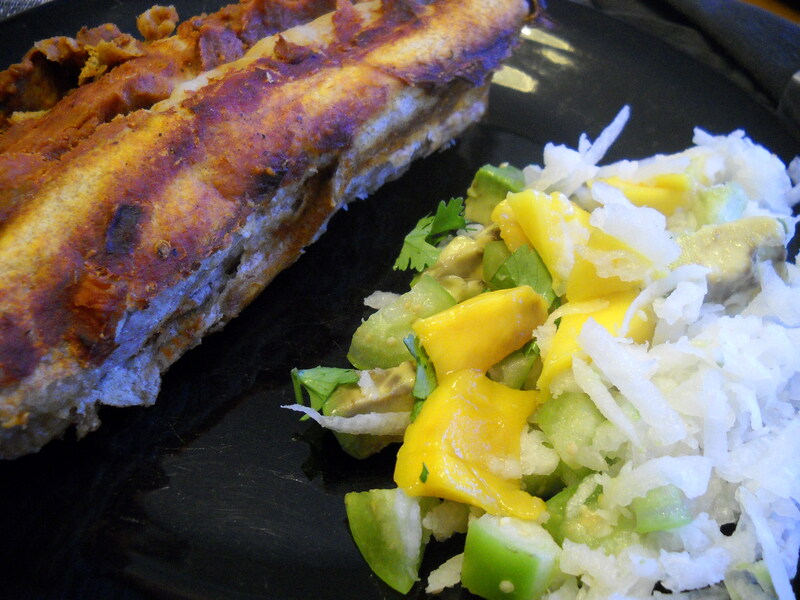 Monday we were delivered potato/soyrizo enchiladas with a jicama mango salad. Yum! I had never tried jicama and it was good. I will definitely try to make something creative with a jicama if they are on sale at the grocery store. 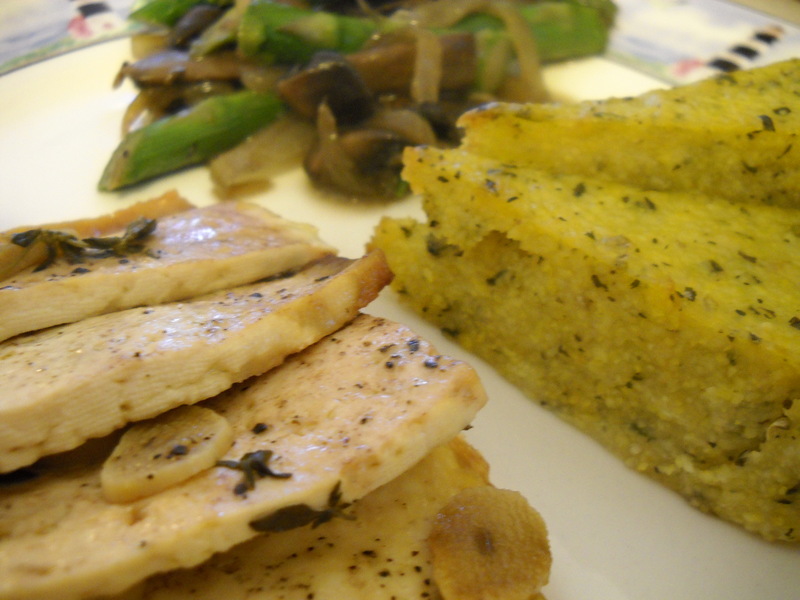 Tuesday night we had garlic baked tofu with baked polenta and sauteed mushroom and asparagus. Baked polenta is so good. It has definitely become a favorite around here. The boys loved the tofu as well and my little bear Adam was eating the mushrooms. He was not very fond of the asparagus. He decided to drop it on the floor for Zeke. My silly little man. Last night’s co-op meal was soup and salad. The salad was a meal in itself. Full of everything under the sun: quinoa, lettuce, apples, red bell pepper, chickpeas, cucumbers, red onion, tofu, avocado, you name it. It was served with a roasted red pepper tomato soup. Such goodness. Tonite I am serving a mustard green blackeyed pea dish to the co-op. 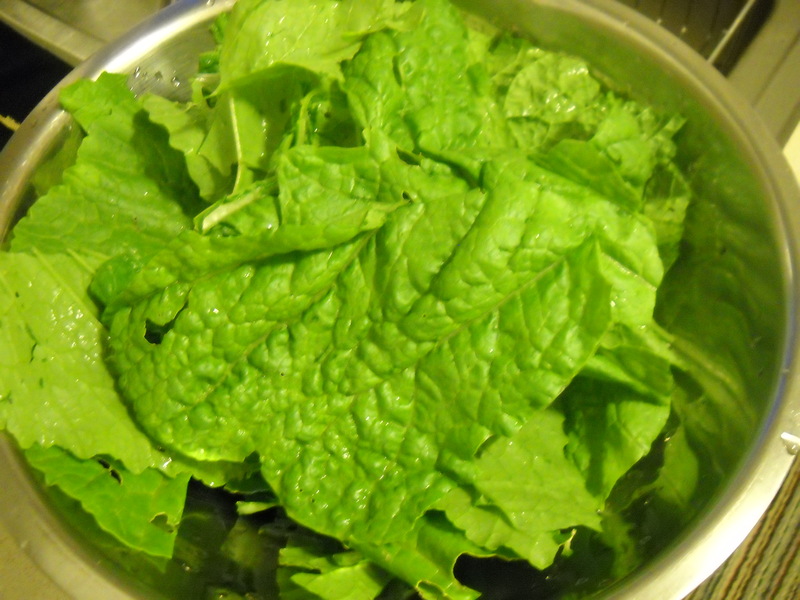 I am very pleased that the mustard greens came from our garden. The dish is a new recipe. It is served with brown rice and some cornbread I made. Speaking of the garden, it is doing great. We did not do raised beds, just gardens in the ground. Foruntately we have very rich soil. The veggies love it. I love being able to go into our backyard and pick fresh veggies. 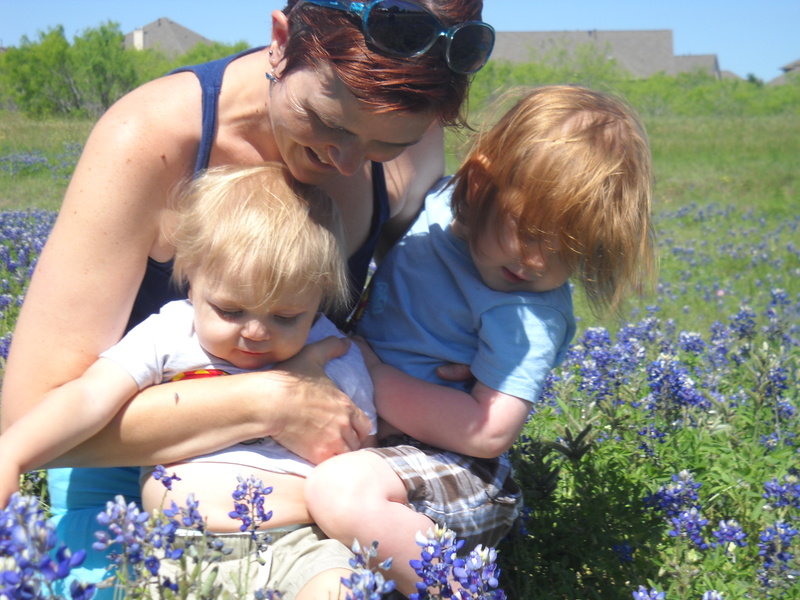 The boys and I planted some seeds for our Summer garden earlier this week. Well Arthur helped me plant them and Adam tried to dig them out of the dirt. Silly boy. We planted yellow squash seeds, zucchini, watermelon, cantaloupe, and okra. Our tomato and basil garden is looking nice. The tomatoes are blooming and the basil is getting bigger. I can’t wait for fresh tomatoes. Yum! Today it is dark and looks like rain is coming our way. The boys and I plan to stay in and take it easy. Yesterday I was in the kitchen literally all day. I did some baking for Josh’s co-workers and cooked for the co-op. I was actually tired of bieng in the kitchen for once. Well, I am off to drink some tea. Hope you have a lovely Thursday. My two little guys in a box. We’re back. 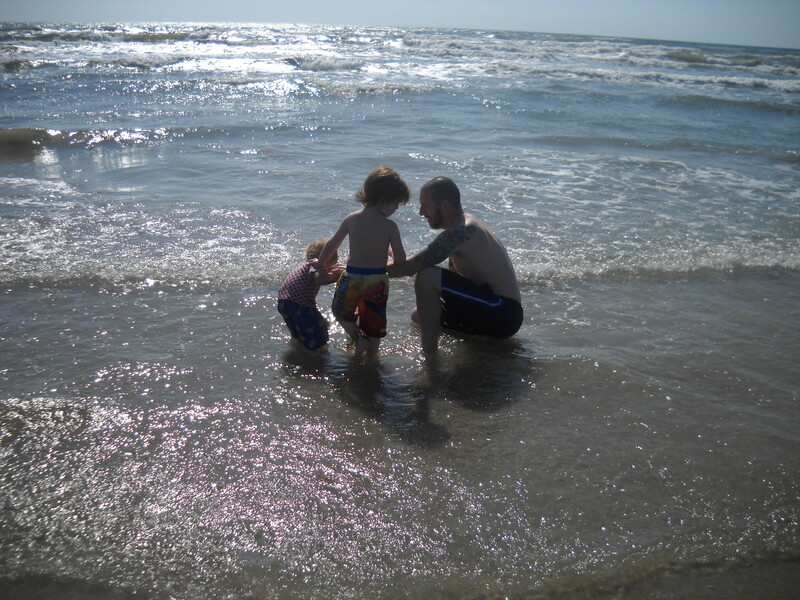 We had a great time at the beach. The weather was beautiful. A bit windy, but nice. It was the boys first time to camp. Arthur was taken aback by the wind blowing our tent. He was a little frightened, but once we explained what was happening he was okay. We enjoyed cooking over a fire. Eating tofu dogs and s’mores. And walking on the beach. My two little guys enjoying the water. 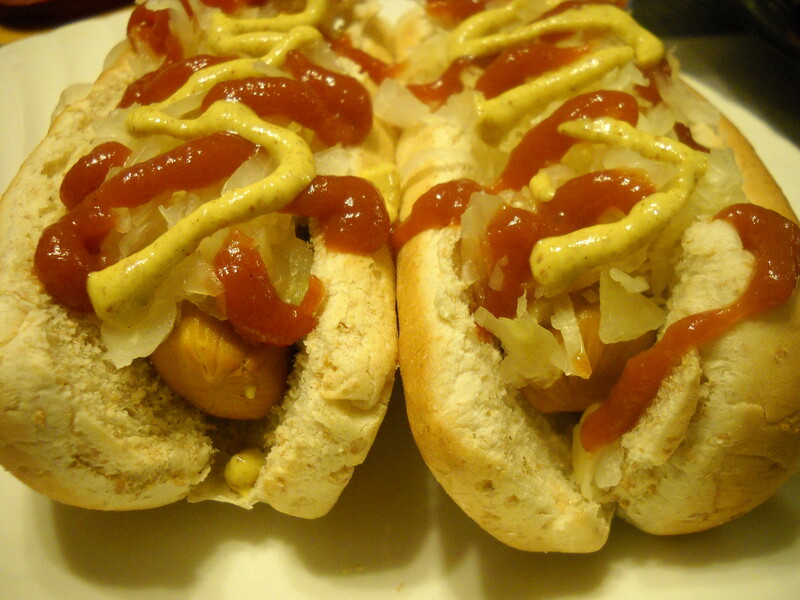 Hot dogs with saurkraut. So good grilled. Thursday evening while packing and prepping for our beach trip, I made an Indian tofu curry. I also served it to our dinner co-op. 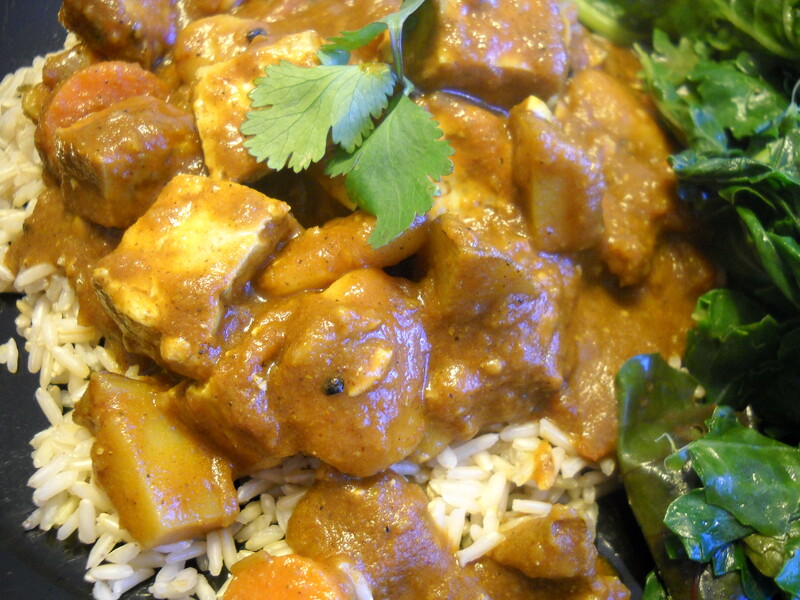 The curry was served over brown rice with sauteed greens on the side. The dish was quite tasty. We like it a lot. I originally made it with seitan, but I think it is better with tofu. One of my testers subbed chickpeas for the seitan. That sounds delicious too. Speaking of greens. When we came home from the beach, we checked the garden. Our greens are going crazy. 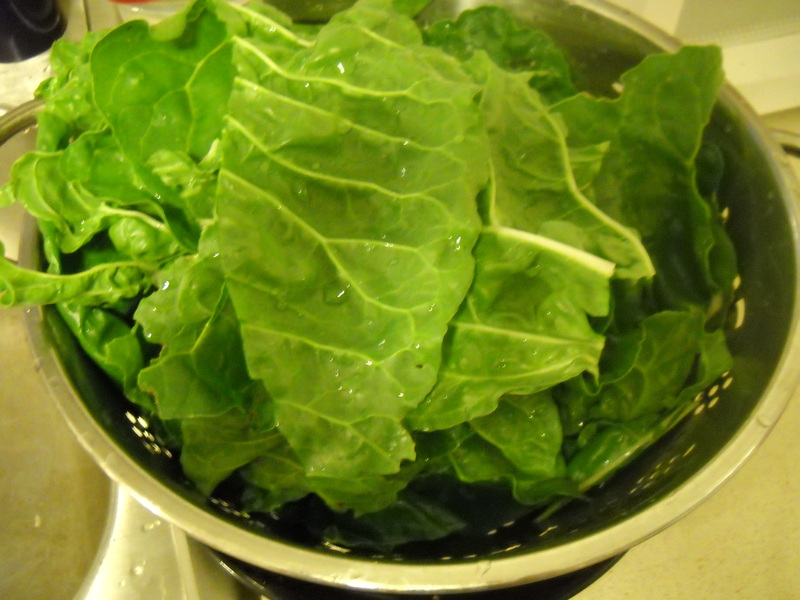 I harvested two bunches of collard greens and three bunches of swiss chard. I found a methond online on how to freeze the greens to use at a later date. 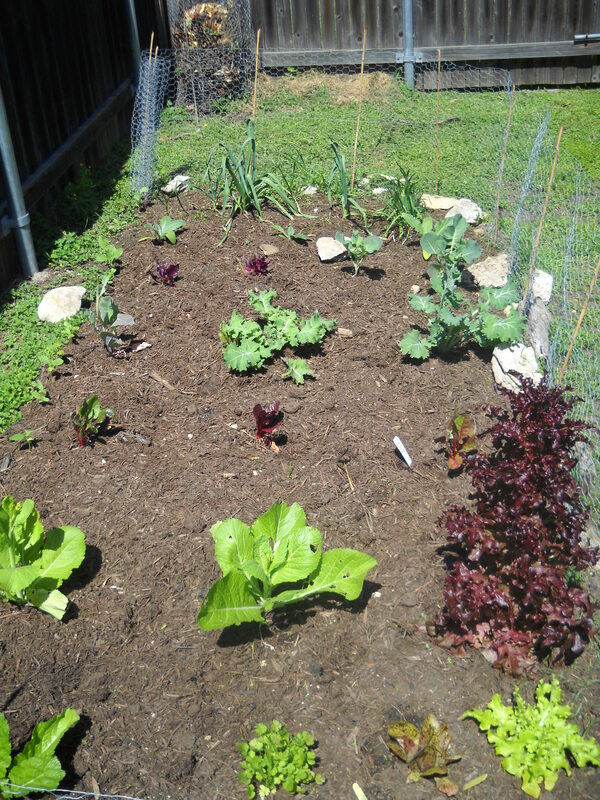 Have I mentioned how much I love our little organic garden? The broccoli is looking great and the tomatoes are blooming. I think we will have a ton of tomatoes this Summer. I planted seeds in small containers and they have sprouted, so I will have to find a space for butternut squash, spaghetti squash and small pumpkins. Yay! Well I am off to do my weekly baking and tend to the garden. Hope you have a wonderful day. 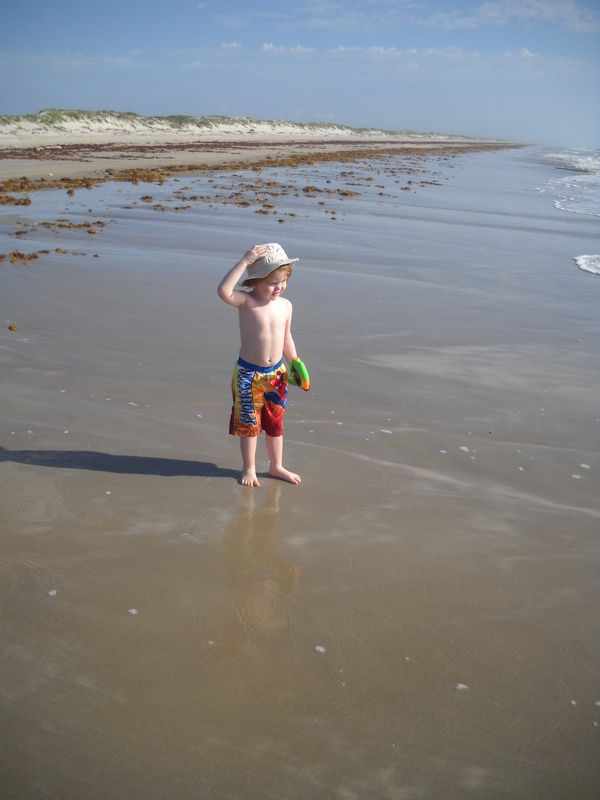 We are headed to the beach early tomorrow morning. We are so excited. It will be the boys first camping trip as well. We are camping at a beautiful national seashore and also going to a sand sculpture festival. We are taking Zeke aka the Zekester. 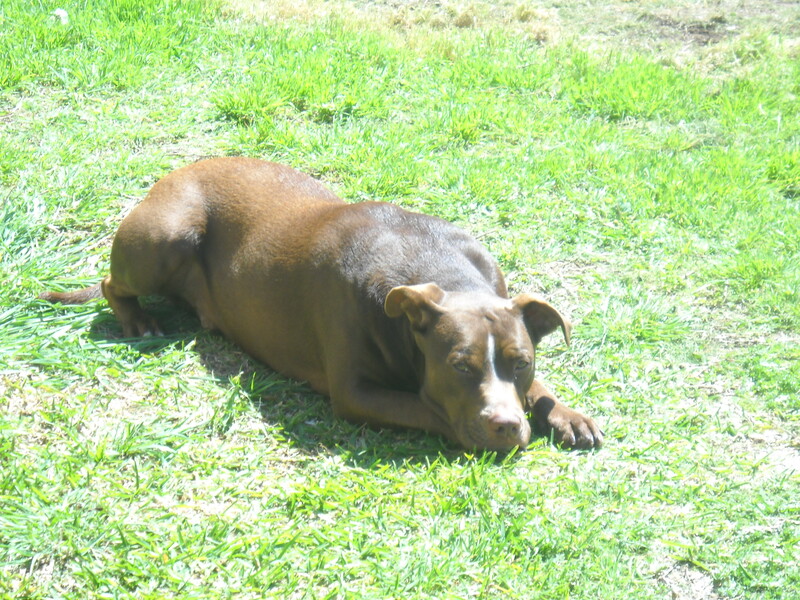 He is such a good dog and he will have fun chasing the seagulls. I am busy today making food for our trip. We will be roasting tofu pups one tomorrow night to make hotdogs and portabellos and corn Saturday night for dinner. And s’mores. Oh how I love s’mores. Since the invention of vegan marshmallows, s’mores have come back into our lives. Hee hee. 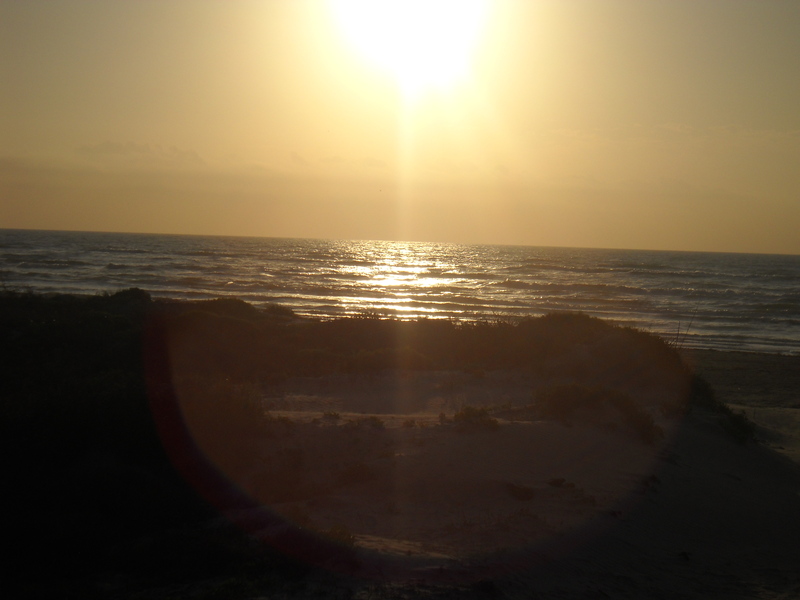 Here is a picture of one part of the beach at the seashore. It is home to the Kemp Ridley sea turtles. They lay eggs on a protected part of the beach and the hatchlings go out to sea. 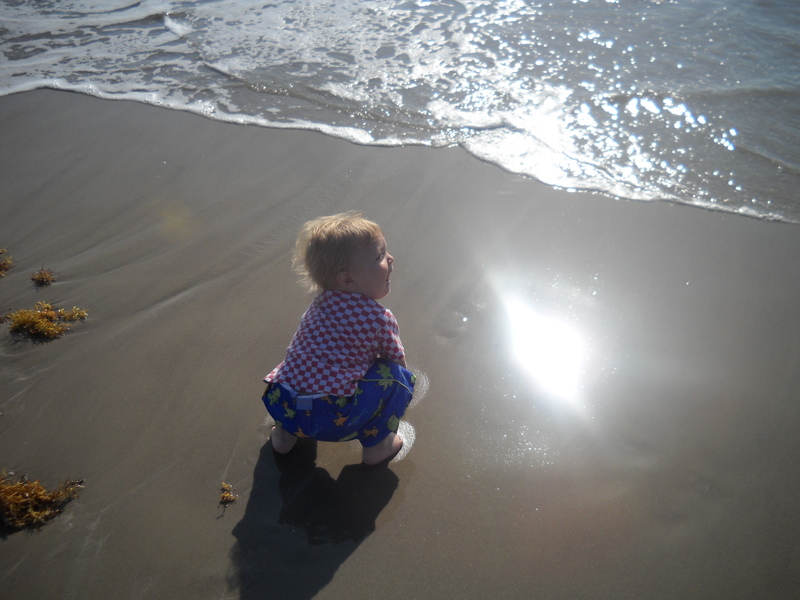 I hope to one day be there when the hatchlings are walking on the sand to get in the water. I know the boys would love it and it would help them learn about these beautiful creatures and why we need to protect them and their habitat. 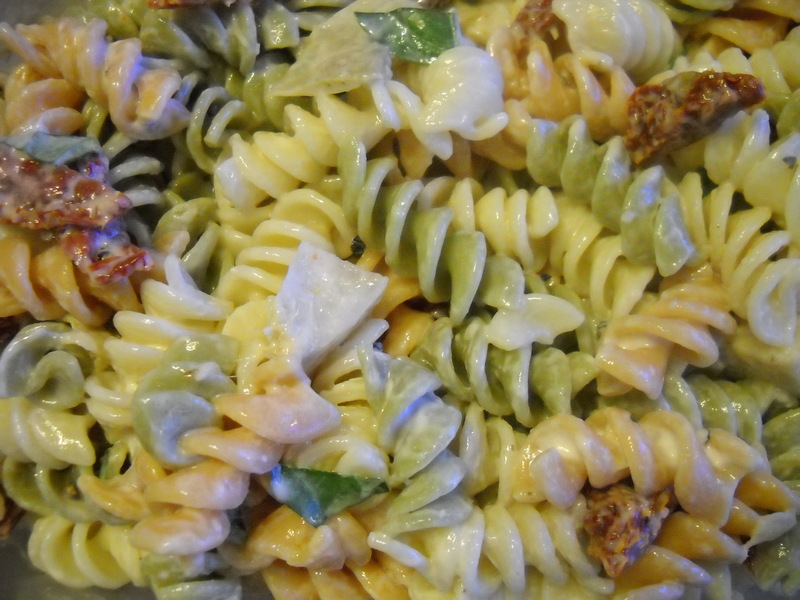 Here is a recipe for a simple and tasty pasta salad. I made it to take to the beach. So tasty. In a mixing bowl, combine all ingredients. Place in the fridge and chill. Last night for our co-op meal we were served a white bean Tuscan soup with garlic bread and baked apples for dessert. It was very tasty and we were given a ton. So much I put some in the freezer. Yay for leftovers! I am posting a picture of plate of kale. Some of you might think this is strange, but really it is awesome. 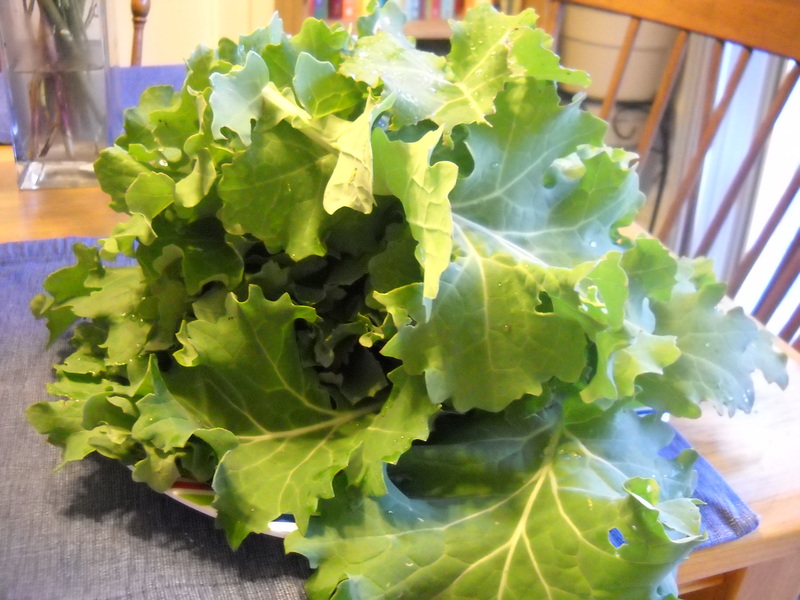 This is two bunches of kale I harvested from our garden. I sauteed it in a little olive oil and sprinkled it with sea salt. It was perfect. I love our little garden. Well I am off to pack and get things ready for the beach. I hope you each have a lovely weekend. Look for pictures on Monday. 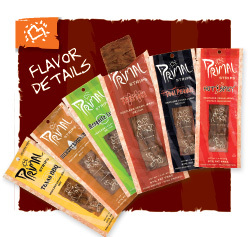 Recently we were sent a sample pack of Primal Strips from Primal Spirit Foods. Having never tried Primal Strips before, we looked forward to sampling the the variety pack sent to us. I was first impressed by so many flavors they had to offer. The flavor offerings are Thai Peanut, Mesquite Lime, Teriyaki, Hot & Spicy, Hickory Smoked, and Texas BBQ. The Primal Sticks are made with seitan, soy, and shiitake mushrooms. The texture was very palatable. Each flavor of jerky was different from the other and offered a lovely spiciness to the strip. Living in the South, jerky is made of meat. Ugh. You mention jerky and you are offered beef, deer or pork jerky. No thanks. If you have not tried Primal Strips, you should, they are all natural, no artificial colors or flavors, preservative free, and of course vegan. Each flavor was perfect. It was hard to find a favorite. I love them all. Now on to business as usual. 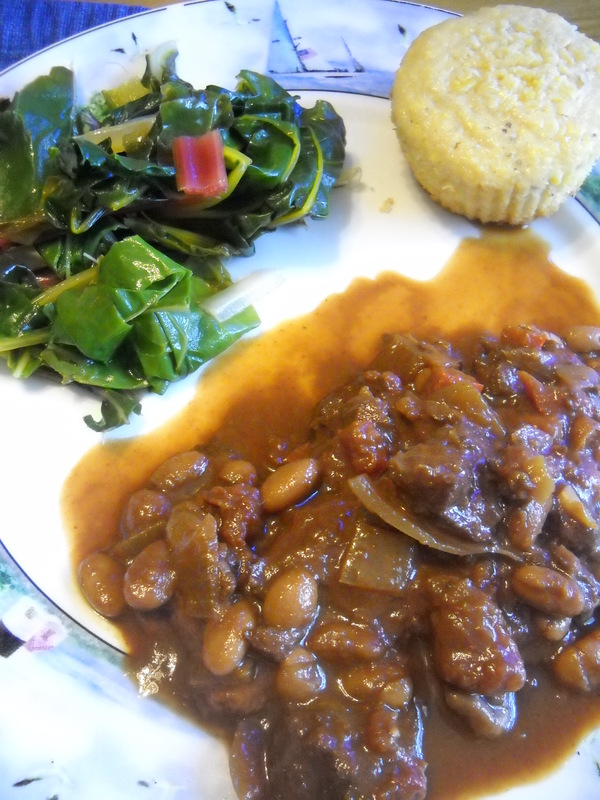 For our Monday co-op dinner, we were served chili sin carne al mole with sauteed greens and maple corbread muffins. The chili was spicy. Which I absolutely loved. And the muffins were perfect. The boys inhaled the cornbread muffins. This meal was delicious. Something I will definitely make in the future. 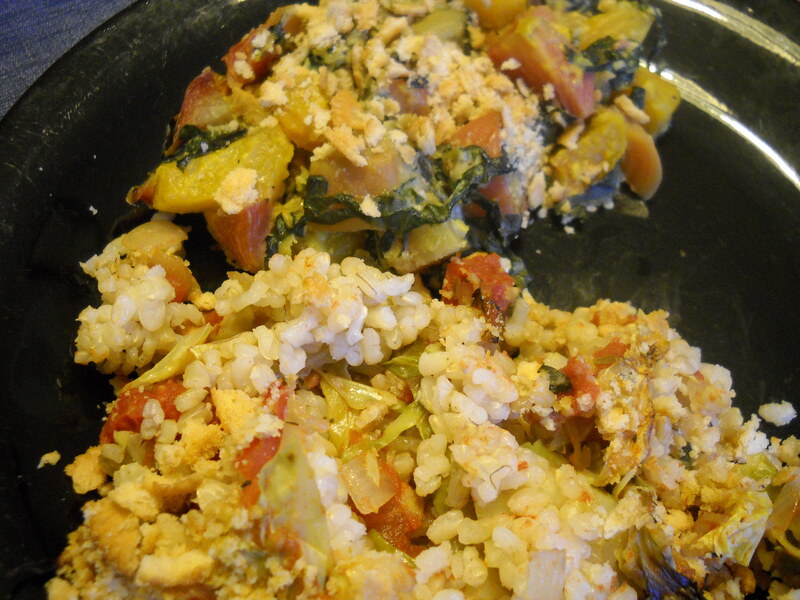 Last night for our Tuesday co-op meal we were served a rice cabbage casserole with a beets and greens gratin. I love cabbage, so the casserole was right up my alley. Arthur ate some of the casserole which is a big step for him, since he is the pickiest out of my two little guys. Adam loved both. The best part of this meal was the fact that a majority of the veggies came from our Tuesday night chef’s garden. Nothing beats a meal fresh from the garden. 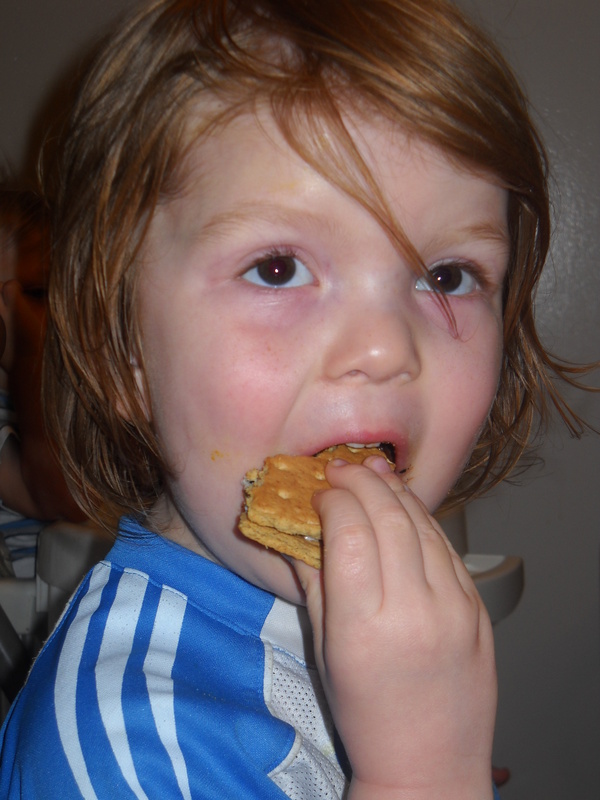 And I almost forgot to mention we also received oatmeal cookies with coconut, pecans and chocolate chips for dessert. Yum! Most of us have our favorite list of blogs. You know the ones you check on a daily basis. There is one in particular that I like and am going to mention. I was also mentioned on today’s post. “Thank you.” The blog is Reduce Footprints. With the environment going to hell in a handbasket and animals becoming more and more extinct. It is nice to see a blog that is about making a difference and how you too can make a difference. There are tips to reduce your footprint on the earth. Every Wednesday there is a new challenge, called “Change the World Wednesday”, which I really like, plus gardening tips and more. Here at Two Vegan Boys blog, we are all about preserving Mother Earth, eating healthy, and being the change we want to see in the world. Check out Reduce Footprints and see what you can do to make a change in the world around you. Today is a busy day for me. I am cooking for the co-op and I have some bread that I need to make for Josh’s coworker. And a ton of laundry. But the best part about the chaotic day. We are getting ready to go to the beach. 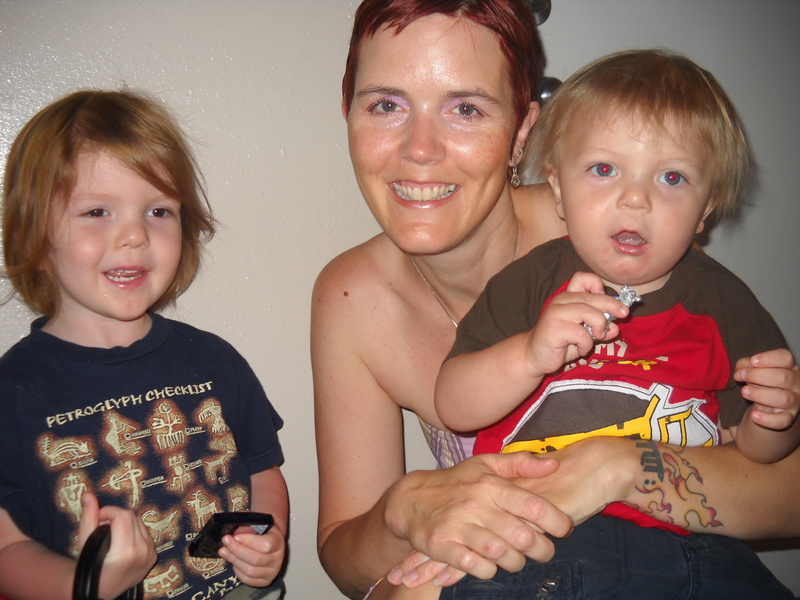 We are leaving early Friday morning and will take the boys on their first camping trip. Yay! I can’t wait. We are going to make s’mores, roast some tofu dogs, build sandcastles, play in the water and check out the sand sculpture festival. Well I am off to cook and drink a cup of coffee. Hope you each have a lovely day. Hi there. How was your weekend? Ours was nice. Josh didn’t have to work. Thursday I made a roasted carrot coconut curry soup for the co-op. I served it with a salad and bread. We didn’t eat the bread due to Passover. 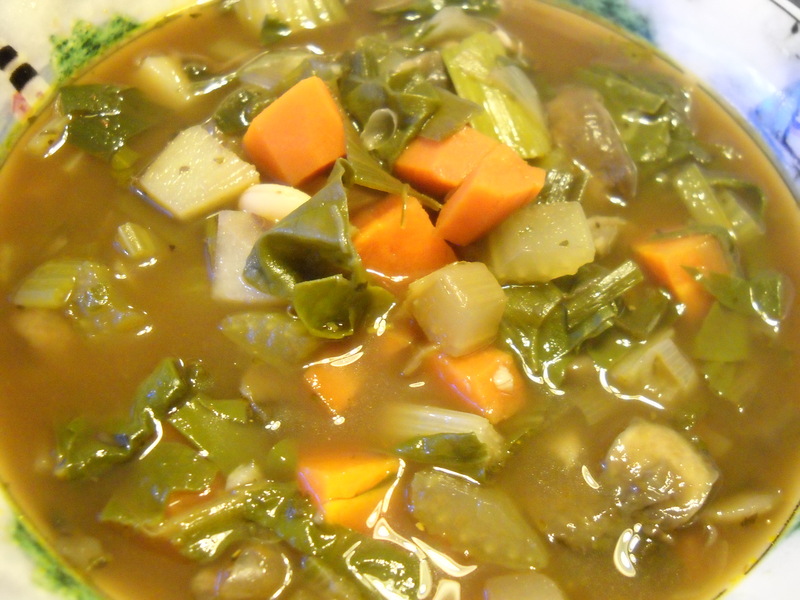 I took a picture of the soup, but it is quite ugly so there is not one. We liked it a lot and one of the other family members sent me a message saying, “The soup was freakin’ awesome.” That was nice to hear. Friday there was no pizza night for us. We are not strict with Passover, but we do avoid bread, pizza dough, and muffins. 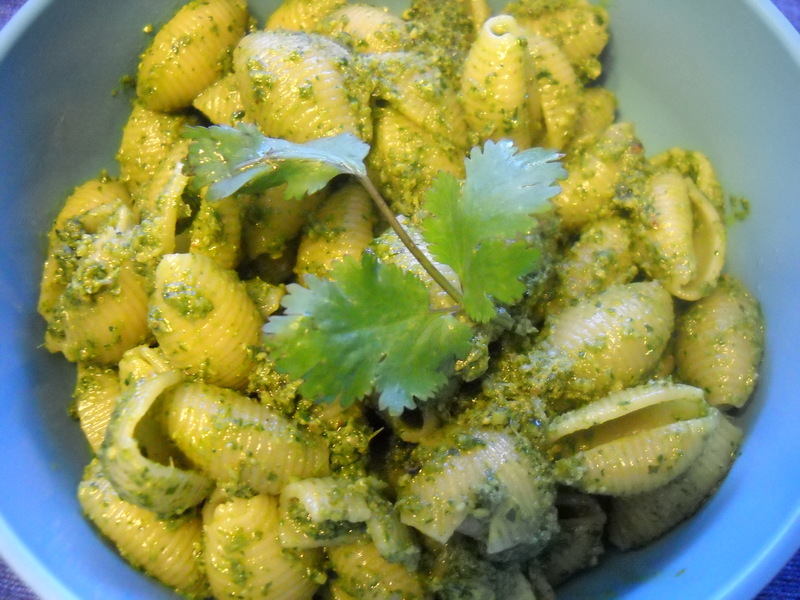 So we had pasta with a cilantro pesto sauce. It was so good. The boys enjoyed it too. Yum! Saturday was leftover meal kind of day. Sunday we went to visit relatives. It was nice to see everyone. We haven’t seen in a very longtime. The boys had fun visiting with cousins. They loved their Easter baskets. Our family celebrates Passover and the boys get Easter baskets from their non-Jewish grandparents. When we got home, I cooked us a tasty dinner. 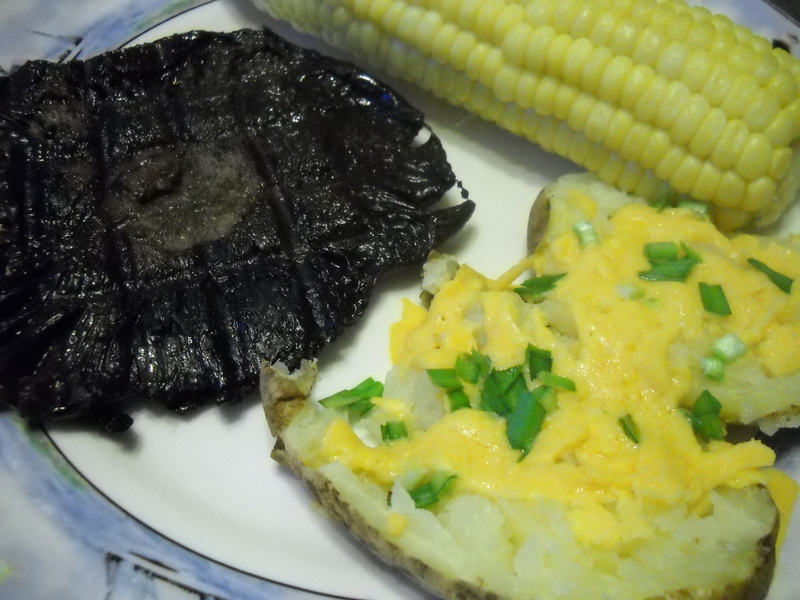 I grilled some portabello caps, baked some potatoes and roasted some corn. It was so good. I had my hands full of baking yesterday as well. Two of Josh’s co-workers asked me to make some goodies for them. I made jalapeno cornbread, two loaves of sandwich bread, and a dozen large breakfast muffins-4 strawberry, 4 cranberry lemon, 4 blueberry banana. Such goodness. 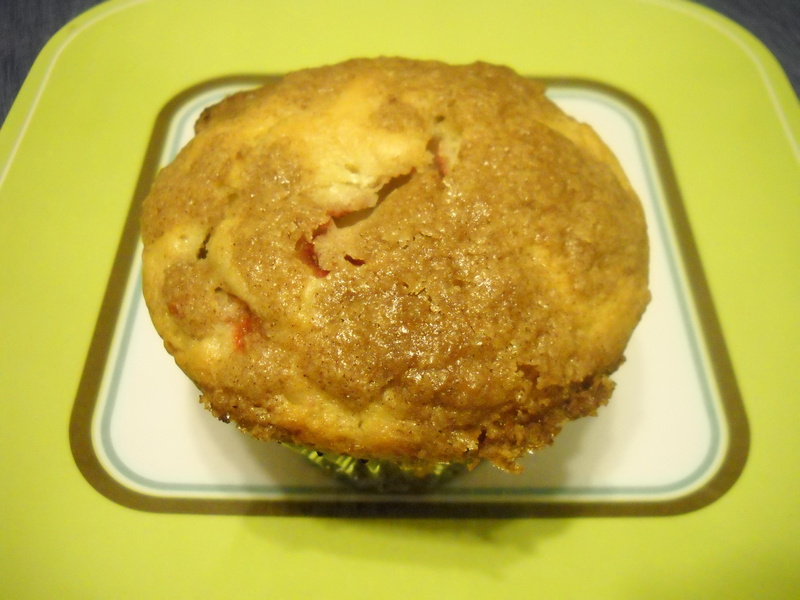 Strawberry muffins. Perfect when using fresh strawberries. Blueberry banana. A favorite with the boys. 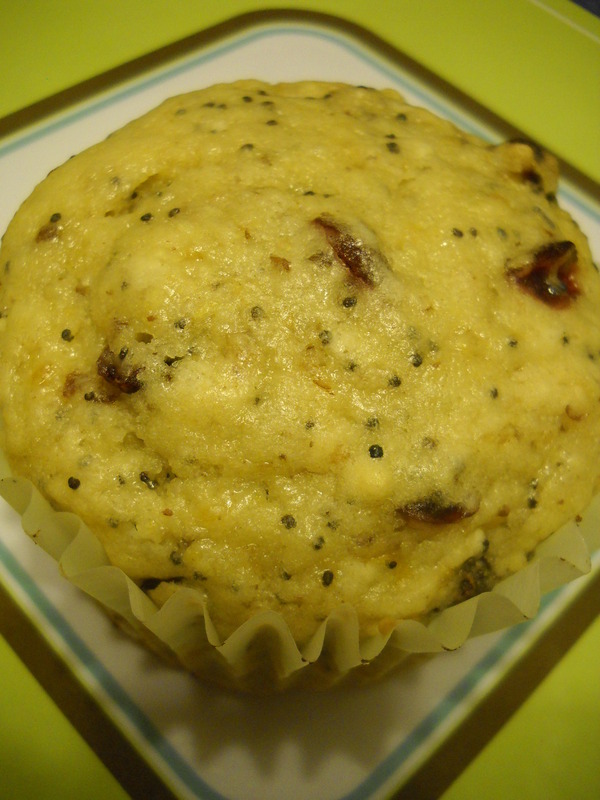 Cranberry lemon muffin. My favorite. I am off to make some sandwich bread for the boys and cupcakes. Arthur informed me that he “needed” cupcakes. So, I am making him some agave nectar cuppies. Hope you have a lovely evening. About a month ago we started a Spring garden. It is doing quite well. We have the “greens’ garden. It contains the following plants: redleaf lettuce, green leaf lettuce, a spotted leaf lettuce, cilantro, a dill plant, kale, swiss chard, mustard greens, a beet plant, broccoli, artichokes, garlic, and garlic chives. The second garden we have is the tomatoes and basil garden. It has two beefsteak tomatoes, 2 yellow tomato plants, two romas and 3 basil plants. I am also trying my hand at container gardening. 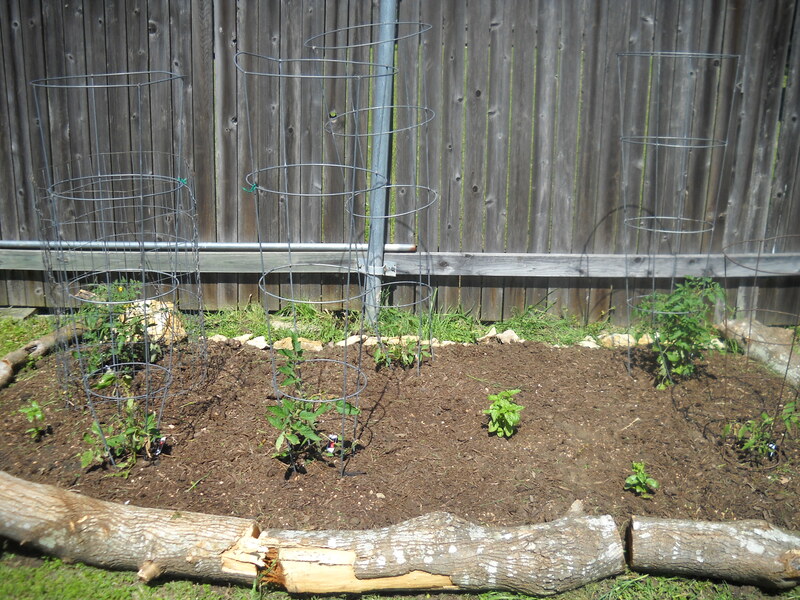 I recently planted 4 more tomato plants, a serrano plant, a jalapeno, a habanero, and a cucumber plant. A good friend gave me an okra seed planting and an eggplant. I am going to try to container garden those as well. And we have mint, rosemary, thyme and sage in containers. They are great because we use them throughout the whole year. We rent, so I couldn’t turn the backyard into a giant garden. I am so going to do that when we buy a house. I love our garden. It isn’t the biggest, but it is given lots of tlc and the boys enjoy watering it and checking on it everyday. I am also going to start a page of what I harvest in our garden for the year and see how much money we saved. Our tomato and basil garden. We are also joining a CSA. Yippee! A friend is going to split it with me. 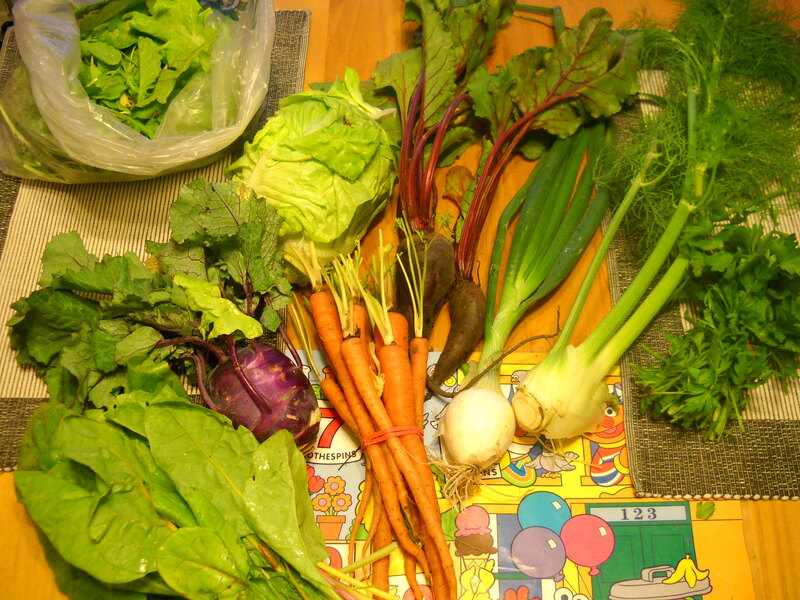 There is a local organic farm east of the city that we will start there CSA program in late April. I opted to split the CSA because we have a garden and the fact that $300 is a lot to cough up right away. It is 10 weeks of organic veggies from the farm at $30 a week. So she is paying $150 and so are we. It will be great to not buy any produce from the grocery store and get fresh, just picked organic veggies. New recipes will follow too. For dinner co-op meal we were served pineapple cashew quinoa stirfry. The recipe is from V-con and I must say, it is freakin’ awesome. I made a kid-friendly quinoa for the boys. Similar to our dinner. 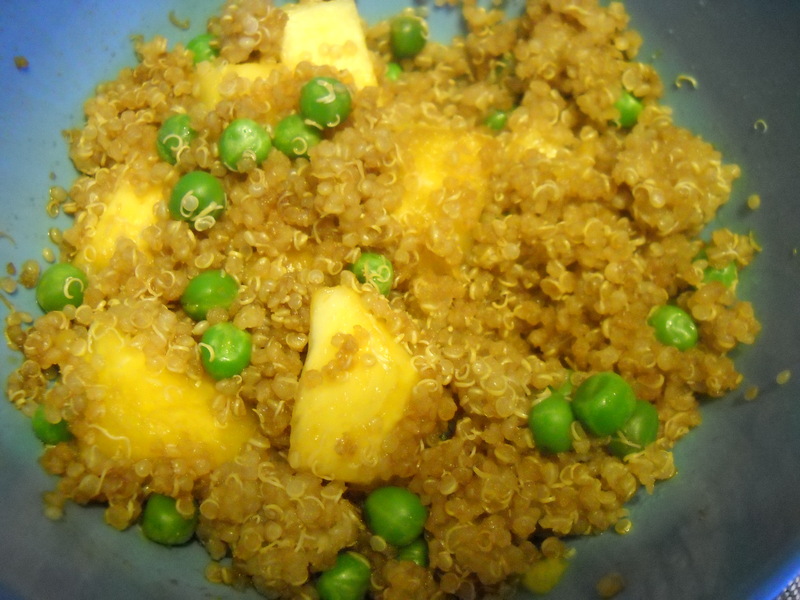 It was quinoa, peas, pineapple, shredded carrot, sesame seeds and tamari. They loved it. And the boys can’t get enough pineapple. They go through one pineapple a week. 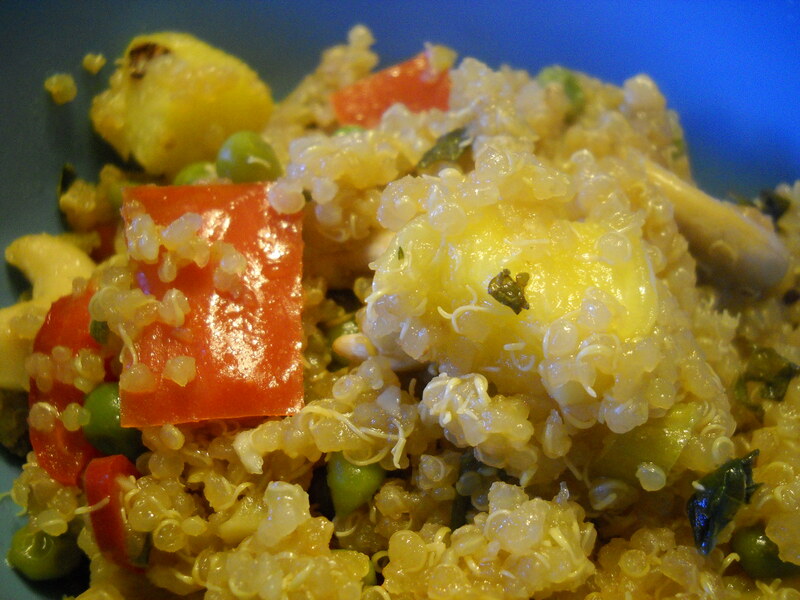 Pineapple cashew quinoa stirfry. Yum! 7 year ago today after returning home from getting married in Scotland, Josh and I went to the Justice of the Peace office and made our marriage legit in the States. Happy Anniversary to us. Life is great. Well I am off to make some cilantro pesto to freeze. A good friend gave us a ton of fresh cilantro from her garden. It is so good. If you have ever had fresh garden cilantro it is the best. So much better than the stuff from the store. You can definitely taste the difference. 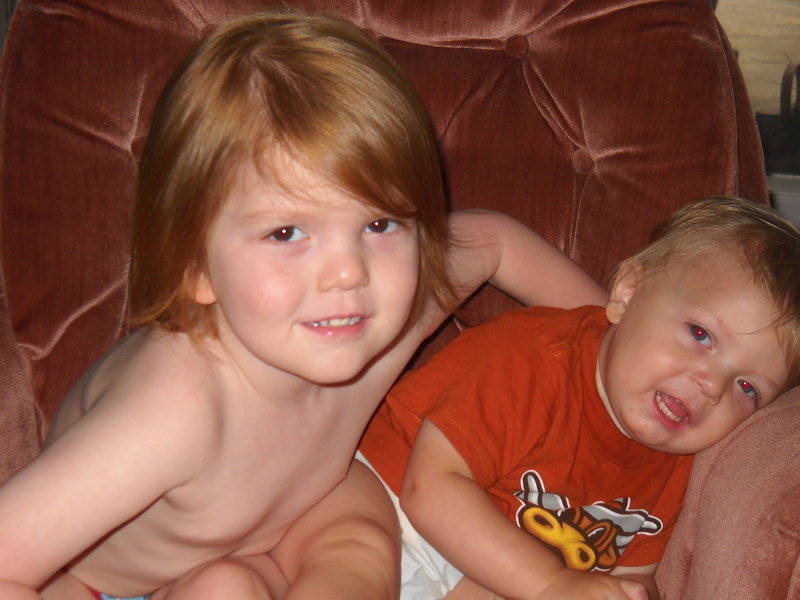 Arthur giving his little brother a bear hug and a kiss. So cute! Hope you have a lovely Thursday.